Boogie in Elysian Park. DISCLAIMER: this is a very old photo. Boogie no longer wears one of these prong collars. I am now training him 100% with positive reinforcement. No physical punishments. Dr. R. took some skin and hair samples but we won’t have definite results for at least another 10 days. However, he doesn’t think it’s mites or ringworm. It is most likely a secondary Staph Infection caused by allergies. Based on his knowledge of Boogie’s symptoms and how Boogie responded to various meds, he believes the allergies to be related to the environment or the season rather than to food. He prescribed oral antibiotics (Cephalexin) for at least 2 weeks. A dog’s skin normally harbors Staph (Staphylococcus) bacteria. If the skin is normal and the dog’s immune system is normal, Staph causes no problems. Your dog is more likely to develop a bacteria allergy if it is in other ways unhealthy, or if it has other allergies. Signs of a bacteria dog allergy include hair loss that is often round and 1/2 to 2 inches in diameter, red blotches on the skin, and possibly the development of pus pockets filled with fluid. Common veterinarian practice is to do a blood test, prescribe the Antibiotic Cephalexin and the immune stimulant shots of ImmunoRegulin.Corticosteroid Cream, or a Steroid Drug, or a NSAID. Veterinarians will also instruct you to give your dog baths with a Medicated Shampoo. The lesions will usually clear with Antibiotics but return as soon as the antibiotics are discontinued. With continued use of antibiotics, dogs become resistant to the antibiotics, and the Staph-allergic dog has recurrent infections. Sounds kinda depressing. Poor little Boogie Monster. If you have any experience with this, please share! *UPDATE: Boogie’s skin is looking MUCH better! After 3 weeks of antibiotics, his hair hasn’t grown back yet, but Dr. R said that this would take some time. Boogie has to continue taking Cephalexin for another 3 weeks. Entry filed under: Skin issues, Vet visit. I’m so glad I found your blog, it was recommended by a friend. I also have a Boston (Tycho has 2 blue eyes ), he’s 4 now. He has had severe skin allergies ever since we moved to Vancouver Island, BC. The vet has told me it’s very common for our area. Unfortunately he has been on antihistamines & allergy steroids for a few years now. Whenever I try to reduce the amount he flares up right away. We also have him on a skin support food that seems to help a bit. Tycho doesn’t get red blotches just black elephant skin, mainly his armpit regions & elbows. But I notice that Boogie’s gas smells differently depending on what I am feeding him. The Honest Kitchen = less stink; kibble = super stinky. Meaty treats = intensely stinky! Probiotic supplements or plain yogurt helps! I’m going to try to get my hands on The Honest Kitchen, it’s hard to find in Canada. Hi, I have a black toy poodle that had a small spot the size of a nickel. It grew 3x larger in 4 days, It was flat, grey and scaly. I took him to the vet and he said it was ring worm. He gave me anti fungal pills and shampoo for $91.00. With the treatment the spot went away but now he has red sores that have alot of green crust. I think its from bites or maybe some kind of skin allergy. Any one else have this problem? Hey hows Boogie doing? I took my toy poodle to the vet and sure enough it was staph. He was cool enough to call in antibiotics to my local meijer where they were free. I also got the smampoo and spray. Thanks alot for your info, good luck and take care. Glad you found out what it was! Boogie is doing OK. He just finished a HUGE course of antibiotics for his skin… poor little fella’. We go through this every summer. When your Boston had the dry patches on its back, did it also happen to have ‘pimple’s” on its stomach/inside legs too? He had pimple-looking things on his body but they were all over… not specifically inside his legs or on his stomach. They would dry up and become crusty. Melissa – I just got home from the vet. Boogie has staph again 😦 and yes, there are pimples on his stomach. I am so glad I found this blog. I have a BT named Lily. We’ve had a few health issues for the past couple months. She started getting those crusts like Boogie’s. They did skin tests at one said it was just a fungus and gave us a shampoo. She was also having allergic reactions to a food so we stopped the shampoo after 3 weeks, trying to figure out what was the allergy causer. Then the other day I noticed the spots are back and everywhere! They don’t seem to bother her too much. I think I am going to make another vet appointment and suggest Staph Infection. I was wondering how Boogie is doing now? What is the long term prognosis for him? The Staph seems to be a recurring problem for Boogie and we don’t know why. This happens mostly in summer and for the rest of the year he is OK and I suspect it is something in the air or in the grass… I haven’t had Boogie allergy-tested so I don’t know for sure. I would definitely talk to your vet about staph… The antibiotics do work. The photo if your dogs back showing the bare spots look just like my dogs back! I have a “pound puppy rescue” rat – terrier whippet mix that is about 11 years old. For the last 3 years she has been dealing with this nasty-dry-crusty-stinky-itchy skin! Three vets later and they have tried everything from meds, to steroids to expensive shampoos and it still comes back. The last vet said that they can give her steroid shots when it flares up to releave her itching, but the effects (of the steroids) will eventually cause liver damage. The vet did not recommend doing any food allergy testing since it can be quite extensive and expensive and still may not help! So frustrating! 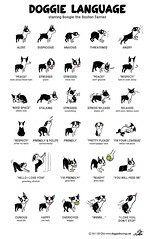 I’m so glad I found this, my Boston-Mix “Chopper” is having the same problem. I feel terrible for him, and I’m so glad to not fear that it’s Mange. My dog Pete has the same thing. It’s a seasonal allergy (rag and pig weed, certain grasses etc, I had him tested) with a secondary staph infection. It’s heat related, always summer, some years worse than others. For the past few years it’s been dormant but this year is the worst ever. Bedadryl helps a little. I’ve just started Quercetin, we’ll see. I’ve been trying hydrogen peroxide, which doesn’t work. I’ll try apple cider vinegar now and if he doesn’t get better I’ll go to antibiotics. Baths help, once a week at least. He’s on fish oil all year round and raw food. I thought I had beaten it until this year. What a bummer! He gets bumps all over and then the crusty patches, mostly on his stomach and underarms. Pete’s a mix, Boston/Cocker and Archie (no allergies thank goodness) is a Boston, neither farts much, they get only raw food, when I tried Honest Kitchen they really let loose! My bullmastiff/rottie mix has seen 4 different vets, had skin biopsies, bloodwork everything. She is 9 years old and for the past 3 years she’s had patches on her back and stomach of dry flaky skin so bad if I pet her and pull the fur ever so lightly it just comes out in clumps…. One vet had her on cepelexen for 6 months, another vet thyroid medicine for 6 months, another vet said she was zinc defiant so she took 4 zinc pills daily for a year, and the last vet has had her on medicated shampoo… I can’t seem to find a answer for this. She eats a very well balanced diet, but I just can’t seem to get a grip on the hair lose. I’d be interested how many people have had good luck with apple cider vinegar baths? I may try it. Thank you all for this blog. So sorry that you are going through this. I have started seeing a different vet to get a second opinion (unfortunately this vet is way more expensive than our regular vet). Have you considered taking her to a skin specialist? I think it is funny, that I’ve owned dogs for almost 50 years and never experienced this staph, yet this year almost every dog owner I know (including me!) has reported this same issue. Sure wish I knew what the ROOT CAUSE of this is because it doesn’t seem to permanently disappear! Is Staph a new trend, then? I feel the same way you do! I have always had a dog as a pet but my lab now has the same thing!! He has dry crusty small places right in the middle if his back and the underside of his tail. I can give him allergy medication and they clear up. We have switched to grain free food and even tried venison which was supposed to be better but this made them worse. Trying to figure this out on my own. The vet first said ant bites but never heard of a ant crawling all the way up a dogs leg to bite him on the back. They then said some type of allergy and put him on steroids which made them better but I really don’t want him on steroids and allergy medicine all the time. I’ve heard alot about the vinegar so going to try this to see if this helps. I’m like you I’m getting to the bottom of this!!!! I have the same problem my dog has the same spots started out on his chest and worked his way down to his belly and then up his sides and ended on the back in a short time i went to my regular vet and he said is allergies and gave me some spray it didn’t help it got just worse then i went back and he said fungus so he gave me another spray didn’t help either so i went to another vet to get a second opinion after i told him what the other vet said he suggested a biopsie wich we did and went through one month antibiotics the spots gotten a lil better and the biopsie stated it was a staph /bacterial infection , as soon as we stoped the antibiotics the spots came back so i went back to the vet who did the biopsie and he gave us steroids for 4 weeks my dog was suffering with the steroids he peed a lot and drunk up like 4 gallon of water a day , a few days ago he was done with the steroid treatment and all spots were gone and just yesterday i noticed they are coming back he have some small spots on his back and sides so i called the vet and told him he said he want to put him on steroids again for 4 weeks and he told me that as soon as the spots are gone before the steroids run out to give him another call because he will give me another medication he also told me to put him on a lamb rice diet just in case and give him a bath like once a week with medicated shampoo that is itch relieving i did all that but nothing really seem to help and i havent put him on the second round of steroids yet , i don’t want him to suffer again and give him a break for a few days , maybe i will try that vinegar rinse too if anybody has some positive results with that ? other than that this is the first time my dog has something like that and i am really frustrated with all that medication he has to take and every 2 hours let him outside so he can relieve him self even at night we been trough hell the last 5 weeks and it seems like there is no end in sight and nobody knows where it comes from , by the way my dog is a bloodhound labrador mix and he is 3 years old , if anybody know any other solution for this problem please let me know i would really apreciate it . This is the way my lab was! I believe the steroids just caused another problem! I’m trying the vinegar tomorrow! Our Min Pin has staph too. He’s on abx right now. We are going to try the apple cider vinegarbto see if that helps. I too am wondering if this condition is becoming an epidemic? Reading all of this, I too am wondering if the Staph thing/this skin issue is some sort of epidemic! My totally healthy and active 9 year old weiner mix who has never really had any serious health problems just started suffering from this skin issue a few weeks ago. It is so weird! Please keep sharing what you all have been using…I am going to try a few things I have seen so far and will report back on anything that works. I have a cocker spaniel that has had this 3 times now and this time is worse than all the others. The vet did a scraping and said it was a staph infection probably secondary to an allergy.She has those crusty patches all over her. If i touch any of them she scratches and it seem to help with the scaling and healing if i scrub that nasty stuff off her skin when i bathe her but then it leaves a bald patch but it does help. I use a chlorahexidine shampoo on her.She is on cipro twice a day for a month but it doesn’t seem to be helping her. . I home cook for her and use U stew in her food as the supplement hoping this would be better. Not sure what else to do. Maybe i’ll try the vinegar rinse as well. My cocker has been going through for about 2 years now. He is 12 and always seems miserable on antibotics. Not sure what to do to make him more comfortable, he is getting old. The antibiotics also kill the good bacteria as well. The bacteria in your dogs intestines gets killed when it should be helping turn your dogs food into poop. To solve this problem, I give my dog regular yogurt. It helps replenish the ‘good’ bacteria in your dogs intestines that were destroyed by the antibiotics. Just last summer my Lab/Boxer developed a horrible hot spot on his neck. Vet gave him anitbiotics, steroid and anti fungal medicine. It cleared up, but when the meds stopped, he developed a few small, crusty, dry patches. One patched developed into a cyst. I treated the cyst with epsom salt compresses. It drained and dried out, but left a crusty, patchy bump. I find it interesting that my dog was fine for 4 years and then I got him a rabies shot (free one that was giving by an animal association) and all of sudden he has skin problems. I also remember the disclaimer, that the animal association was not responsible for adverse reactions. I am having the same problem with my french bulldog after a year of giving him the rabies shot. Any luvk with your dog getting better? Lili Im glad that you shared this with all of us!! My poor Moeglie my BT (2brown eyes :)) has health issues for a long time. He started going blind at about 1.5 years old. Hereditary cataracts 😦 it was about a $3,500 fix for us because the closest place that does the surgery is RI or PEI Cananda and we live in central Maine. He is now 8 years old and his eye sight has only been a hiccup for my little man! He did however stumble his way out of the gate one night and was hit by a car. Another emergency visit and he was good as new with 10 staples. This however left him with having occasional seizes from the trauma. Aside from that he has been good… Until now. He started losing his hair on his back and leaving these dry yucky patches. I assumed it was allergies and started changing his food, shampoo etc… But nothing has helped. I started giving him fish oil everyday and it has made it a little better. (He seems less itchy anyway) my vet didn’t really have a hole lot to tell me either other then it was allergies. I’m glad your could shine some light on it for me. So thank you!! Also… Can someone please post if the apple cider vinegar has made any difference. I’ve tried other topical remedies and his skin just gets red and looks sore. I don’t want to try it unless I have a few reviews. All you can do is use hydrogen peroxide and possibly get your dog on some antibiotics and hope it works. If the problem isnt too large, it might go away with some vinegar, peroxide, antibiotics. I have a BT named Hudson and we are currently going through this. The vet said it was an inhaled allergy much like we have hay fever. I have changed his food. There was no difference made in the bumps. He gets small bumps with fluid and flaky patches where he looses hair. We are starting the medicated shampoo and odorless fish oil with an occasional benadryl. He’s not itching too bad though. Also I find if I bathe him or simply rinse him off after being outside for a long period of time helps too. I didn’t want to put him back on the antibiotic and steroids. It just ruins their little immune system among other things. So we are trying a different approach… kind of trial and error. This only happens during spring and summer. This blog has been a big help in what to do. Same story for my dog – numerous vet visits, medication, medicated shampoos, new diet but no luck. I wonder how many if us use the dog beds from Costco that have cedar chips in the stuffing? Speaking of root causes – seems like a possibility to explain the allergies across Canada. I have found that this rather simple technique from Dr. Karen Becker works wonders for problem skin. I have a rottweiler/hound mix, in the past months he has had several dry/flaky spots with yellow scabs all over his back(the hair is also falling out) The vet said it was hot spots and gave him a shot for the itchiness but they got worse! I took him again and we got a antibacterial spray for the spots! when I went to feed him this morning, I noticed more spots on his back! Im worried it something worse! I have the same problem with my dog Goofy. He has had this since I got him/he chose me. I have tried everything. So far he is back on antibiotics, the vet gave his steroids (I don’t want to use it on him).Goofy and I are long haul truck drivers but I find this interesting. 1. we are from all over the country. 2. we all have the same trouble. so what do we have in common. grass and weeds. Does the apple cider vinegar work? well maybe but vinegar works too. It helps put the ph level back into the skin, but it will burn them, if there is open sores. Reactine works for the iching. Head and shoulders works too,oatmeal, and anitbactirial shampoo. Yes you can use this on your dog, just rinse well. hemmeroid cream works also. Hot spot spray works in a pinch to stop him iching. Antibiotics are the suggestion from Guelph Vet school. you are to keep him on them for over a month or more. then wean them off. That is all I have found so far in my research. I will keep everyone posted as to what works and not. Lisa, I didn’t continue with the ACV because frankly I can’t stand the smell of it and if my nose is so sensitive to it I can only imagine how a dog must feel. Instead I am bathing Boogie more regularly with Cortisoothe and Hexadene shampoos… any time he rolls on grass he gets a rinse/bath the same day. I am also adding Brewer’s Yeast & Garlic to his food daily (this is supposed to be a flea repellent). He has been on antibiotics TWICE this summer – just finished a course of 30 days and his skin is much improved though he now has a thinning coat all over (he is going bald!) and I am not sure what is causing this…. If he is on steriods, that’s likely the cause — our frenchie has the same issue. HERE IS A *****FIVE STAR REVIEW FOR APPLE CIDER VINEGAR: I have a Silver Lab who is 17 mo. old. He started exhibiting signs of scratching, horribly dry skin along his back/spine, dandruff, and scabby type lesions on his belly, chest, groin, inner thigh area around 6 mo. of age. We were distraught! After numerous bouts of steroids and antibiotics, the sores improved and healed but returned within weeks of stopping the medication. He then began to lose patches of hair around the sores, and his entire back was thin…..you could see his scalp easily. We ended up having a skin biopsy done and found he has Color Dilution Alopecia. There is a FB site for this under “Color Dilution Alopecia.” According to the blog, we began a strict diet of grain free food, fish oil, Vitamin A, Vitamin E and Melatonin, and oral and sprayed topically apple cider vinegar. WIthin weeks, our dog’s coat improved greatly, and all his hair loss was regrown, thick and healthy. He looked awesome!!! Unfortunately, we have come a full year circle now and the spots and sores are returning. It is now Sept. and the start of allergy season in Western New York. The vinegar works WONDERS and is all natural. Yes, it stinks, but within 30 minutes it evaporated on their fur/skin and is undetectable. We spray a 50/50 solution of ACV (raw unfiltered kind) and distilled H20 about 1 x per week avoiding face/eyes. Just spray dog down when dry….rub gently into coat to get skin damp with it, and then wipe him/her down with a towel. Allow to air dry. Helps tremendously with scratching, hot spots, and keeping mites, pests, and bacteria at bay. It’s not going to eliminate seasonal allergies completely. Unless you put your dog in a bubble to live, it’s always going to be a factor. But it’ll keep your pet more comfortable until the season passes….and will curb the amount of prescriptions and vet visits. One more thing….we also add 2 TBSP of ACV diluted with a little H20 to our dog’s dry food A.M. and P.M. You want to get it in their system orally and topically. Dog didn’t care for it at first but now gobbles it up. He weighs 73lbs….so adjust the amount accordingly. 2TBS 2x per day is alot but he is a big boy. I have a Boston Terrier that gets these spots BAD on her stomach area and hind legs. Usually starts getting it in late spring but also gets it from snacks high in wheat and such. The doctor said the same thing, allergies/staph and wanted to prescribe antibiotics and cremes for a total of over $100. Well Im poor and resorted to the usual Hydrogen Peroxide and Vetrycin hot spot spray. The HP gets rid of the spots better than the spray but the spray is still useful. I use a cotton swab with hydrogen peroxide a couple times per day on the spots and they clear up within a week or two, no problems. Hello! My female BT ( just turned 3, 1 blue 1 black/brown eyed) has the same issue!! Not ring worm, took her to the vet multiple times. We came to the conclusion is season allergies esp when its warm out. Being in south carolina we have really wierd extreme temps: cold then warm then cold again. The spots are all over her back and outer thigh. Normally gets them when the temp changes. I thought something was wrong with snooki 😦 glad I found your blog! Hey guys. I feel your pain!! My Beagle named Beau has been through almost all of the dermatitis skin issues you can have! And yes the vet will give you steroids, antibiotics, fish oil/omega 3 pills, and maybe even a pill to stop itching. Those things work as of right now- combined with bathing him in HEAD AND SHOULDERS!!! I know some people say only put dog shampoo on dogs… But I have tried every dog shampoo. And my moms friend told me to use head and shoulders every two week. I did. And Beaus skin looks better than ever! Seriously it’s worth a try! Good luck. Skin issues, itches, and crusty sores continue to plague my Beagle… But with a strict regimen you can treat the dog so they are much happier and healthier. My German Shepherd has been continually experiencing the same thing and they just seem to be getting worse. They’re saying it’s allergies, but it’s been year round. I’d be interested to know if there is a key or new ingredient in dog foods that could be causing this. Anyone have any ideas? i live in vancouver it seems like alot fo other posters do to, i also feed him the grain free products and the best organic shampooos ect…. This is all very informative, really appreciate all the sharing here. I have a 1.5yo French bulldog who got flaky bald spots on his back that look like Boogies, starting at about 7 months. We have no grass, just a few bushes. I’ve tried feeding him every kind of grain free food with alternative proteins for months at a time. I’ve tried fish oil. Tried probiotics. Tried NuVet vitamins. Tried special baths, topical creams and sprays. Regular vet just told me what I already knew: it’s not mange or ringworm. He doesn’t itch, has no redness or swelling, just occasional bumps that last a day, then flatten out and lose hair, get crusty. Some bumps come and go but most patches have been there all along and never leave. No diarrhea or vomiting. No fleas, ants. No general balding or hair loss, but these spots will not go away. What’s really freaking me out is that my young female Frenchy, who is entirely unrelated, just got a spot on her back, and is the same age as when he started…:( I have an appt for a specialist this month, hopefully they won’t just take my money and tell me to try everything I’ve already tried, and I’m not giving steroids because they aren’t worth it to a dog that seems totally comfortable. Emu oil might help. It has worked wonders for my Boston’s dry skin spots. Thank goodness I found this blog!!! I really appreciate all the stories and now know my Boo is not alone!! I have a lab/boxer cross, Bruno – adopted him just over 2years ago and like everyone else on here I’ve seen 4 different vets about his skin – at first it was dry flaky itchy skin and causing hair loss on his back – I was told it was allergies – first vet said food, then another said it was his ears and bum, and the last did tests etc and said it was definitely allergies something environmental! Back in April it flared up so as always he went on antibiotics and steroids – after 3 weeks we went back and I was advised to keep him on the antibiotics for a further 3 weeks to ‘clear his system’ everything as always cleared – but we now think he developed an immune to the antibiotics because after that course hus back remained flaky and itchy – not as bad as before but not 100% cleared either, so the solution was a short course of steroids!! All had been fine for a few weeks but just over 4 weeks ago it flared up again but this time on his belly/chest and its the worst its ever been – hard skinned flaky bumps and hair loss – except he’s not as crazy itchy on his back as he usually is (he barks at you consistently till you scratch him!!) so I put him on the steroids, it cleared but maybe only 5days after this round of steroids its back with a vengeance but again he’s not suffering with a severe itch – so what now? I don’t want to but him on steroids again – he’s already had 3 or 4 rounds of steroids tablets (15day course each time!) this year alone!!!! Anyone find that the cider vinegar helped? Any other natural based remedy suggestions?? Ps I’m actually in Ireland so whatever is causing this is now further afield then you guys !!! My minpin has the exact same issue. The rash/hair loss seems seasonal.She also has yeast infections that will slightly heal while on antibiotics,but will return when we stop. She has been tested for Cushings disease because of the high cortisol level in her system,but Cushings was ruled out.Which means she can’t have steroids to help her. We have her on lamb & rice formula dog food & are very selective with her treats.Any fish related products gives her a blistering reaction around the mouth. She is now battling the rash again, because of the rains we have had in Indiana. Seems like the damp grass or weeds makes the rash flare up. Have had her to several vets without an answer. I tried Apple cider vinegar both topically & in her water without any results. I know my dog has allergies – dust being one….doing allergy shots. I have tried putting coconut oil on the spots (does help but it’s hard to keep him from licking the oil off) and watered down betadine (he likes the taste of that too); I rub the spot with a rag wet with the betadine solution and then smooth the hair out. I am currently sticking with the betadine but I do worry that will stop working like antibiotics do… Have also heard Listerine (original brown color) works but he licks that too…. If I sit with him and put a rag over the spot I’ve treated he does forget about it after 10 minutes or so. I know my dog has allergies – dust being one….doing allergy shots. I have tried putting coconut oil on the spots (does help but it’s hard to keep him from licking the oil off) and watered down betadine (he likes the taste of that too); I rub the spot with a rag wet with the betadine solution and then smooth the hair out. I am currently sticking with the betadine but I do worry that will stop working like antibiotics do… Have also heard Listerine (original brown color) works but he licks that too…. If I sit with him and put a rag over the spot I’ve treated he does forget about it after 10 minutes or so. OOOHHHHH and when my vet prescribed antibiotics, he also said bathe him twice a week with a colloidal oatmeal shampoo…. Hello. I know when my dog gets spots, the doctor calls it staph as well. Just a minor bacterial infection of the skin caused by allergies. I just found out, after 5 years, that I am %99 sure that my Boston CANNOT eat chicken! I thought she had grain allergies but when I stopped feeding her ALL poultry, her scabs and spots went away. Her ears and belly are perfect now! So what I am saying is, my Boston at least is allergic to poultry and fresh cut grass. I have a one year old frenchy and we also are going through the same ordeal! Hair lose, dry skin and the rubbing in the grass. My vet is telling me that my lil guy has démodé tic mange. I’m using Happy Jack Kennel Dip ll to see if it will help. This is crazy. My Boston terrier had had the same issue since he was 4. He is now 15. We have yet to find a cause. He is on a gf diet. His condition only clears up when we put him on antibiotics. An anti fungal shampoo can also help speed up the process but doesn’t get rid of the condition alone. Maybe it’s a breed condition? I am going to try a new vet who offers acupuncture and homeopathic remedies. I hate putting him on antibiotics every 3 to 4 months. 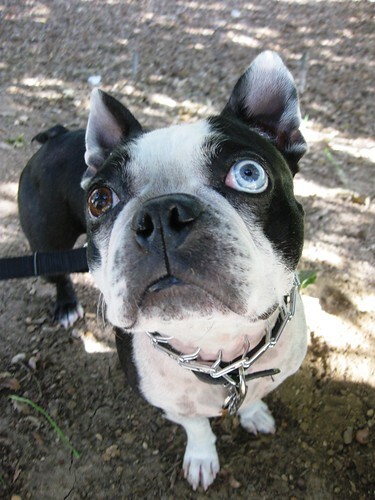 By the way…my girl Boston has David Bowie eyes, too!! Ask the vet to check your dog’s thyroid. My dog used to get staph every summer and we tried all the treatments mentioned but it would just come back after a while. Vet did blood work and my dog has low thyroid. She takes thyroid meds daily now and has no more skin problems. Mini pin had bumps and dry missing areas of hair.Not to mention skin shedding. After trying many things including dog vitamins nothing helped. Friend told me about costco gummy bear vitamins for kids and his health and coat has never been better, I still have a problem with his dry tail slowly getting better but not here yet.